Maybe it was coincidence or fate that I started radio blogging the week that my favorite jazz singer, Shirley Horn died. I had planned to get a few radio blogs under my belt before did one that focused solely on my love for her music. Well, life happens and plans change so I have been listening to her music all weekend. Initially, I was going to do one radio blog with 20 or so of her songs but I decided on a different approach. 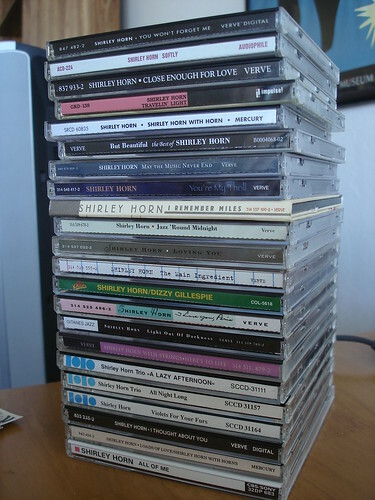 My next four radio blogs (including this one) will be devoted to the music of Shirley Horn. It will be called My Shirley Horn Box Set. She has a wealth of wonderful music so I hope you will enjoy this journey into the music legacy of this great artist. 01 – Shirley Horn – ” Blues for Sarge” from The Main Ingredient (1996) – This just felt like a good introduction for this radio blog especially since you rarely heard Shirley speak. This album was recorded in her Washington, D.C. home in 1995. 02 – Shirley Horn – “My, How The Time Does Fly” – from Softly (1988) – Shirley swings slow and bluesy on this tune which was originally recorded by Bill Henderson. This entire album was recorded in the dining room of an 18th century farm house in Maryland. Joel Siegel’s liner notes give a wonderful insight into Shirley’s life and music. 03 – Shirley Horn – “Return to Paradise” from – Shirley Horn with Strings: Here’s to Life (1992) – For this album, Shirley and her trio laid down the original tracks then Johnny Mandel added the rich orchestration to each track. Shirley has a wonderful piano solo on this song. I always like to call this album the introductory album into the Shirley Horn discography as it was the first one I owned. 04 – Shirley Horn – “Georgia on My Mind” from Violets for My Furs (1981) – While she recorded this song on her tribute album to Ray Charles in 1993, I love this rendition because she belts toward the end but still keeps it cool. 05 – Shirley Horn – “The Eagle and Me” from I Thought About You: Live at Vine St. (1987) – When Shirley swings, she swings hard and that is demonstrated here. 06 – Shirley Horn – “Fever” – from The Main Ingredient (1996) – She sings this song in tribute to Peggy Lee but Shirley brings a coolness that is all her own. 07 – Shirley Horn – “Sunday in New York” from Travelin’ Light (1965) – This song is only 1 minute and 44 seconds but she is grooving on every note. This album was part of a 3 album deal she had in the early 60’s but this was the only album on which she played piano. Quincy Jones, who produced her first two albums, wanted hear her as just a singer. How unfortunate. 08 – Shirley Horn – “My Heart Stood Still” from Your My Thrill (2001) – I like to play this song in the quiet of the night. There is a swell and a silence that is breathtaking. 09 – Shirley Horn – “Isn’t It Romantic [Instrumental]” from I Thought About You: Live at Vine St. (1987) – Another great instrumental from her debut Verve album. 10 – Shirley Horn – “Ten Cents A Dance” from Loads of Love + Shirley Horn with Horns (1963) – This song comes from the two albums which Quincy Jones produced. Shirley does not play piano on these albums but I love her interpretation of the lyrics on this tune. I remembered I was totally surprised me she sang it in her saconcert. 11 – Shirley Horn – “How Am I To Know” from Shirley Horn with Strings: Here’s to Life (1992) – Another gem from this great album. 12 – Shirley Horn – “It Could Happen to You” from Close Enough for Love (1989) – A nice mid-tempo tune from this beautiful album that I found when I was on my quest to find every Shirley Horn album available. 13 – Shirley Horn – “I Got It Bad and That Ain’t Good” from All of Me (1987) – If you listen carefully, you will notice that Shirley bring this melody to a feverish pitch twice before she brings it back down to a simmer. 14 – Shirley Horn – “My Future Just Passed” – from Loads of Love + Shirley Horn with Horns (1963) – This was another one of my favorites from the Loads of Love album. The band accompanies her well here but there were a couple of songs on these two album where the pianist played like they were fronting the band instead of Shirley. These two albums were her least favorite for she was not accompanying herself. I hope you enjoyed this musical journey and hope that you will come back next week for disc 2 of My Shirley Horn Box Set. This entry was posted on Monday, October 24th, 2005 at 6:27 pm. It is filed under Shirley Horn. You can follow any responses to this entry through the RSS 2.0 feed.